Call him the middle bro of the Sandman family, but do it carefully. The Sandman - S is a SOLID footprint. The Sandman - S is a perfect crossover between 5.56 and 7.62, and 300BLK as well as .300 WM. That is an impressive range in a small footprint. The QD system is design perfection. One hand removal in just seconds. No wobble, no seizing, no affected performance; just easy on, easy off, with minimal point of impact shift and no loss of precision. Stellite® baffles are welded into a solid core for added strength and durability. An innovative 7.62 design first, the front cap is detachable and features an integrated flash hider. This affords better performance, particularly in low light conditions. The detachable front cap also provides some level of insurance should the Sandman-S™ get dropped or abused. This equals trouble free replacement in the field. 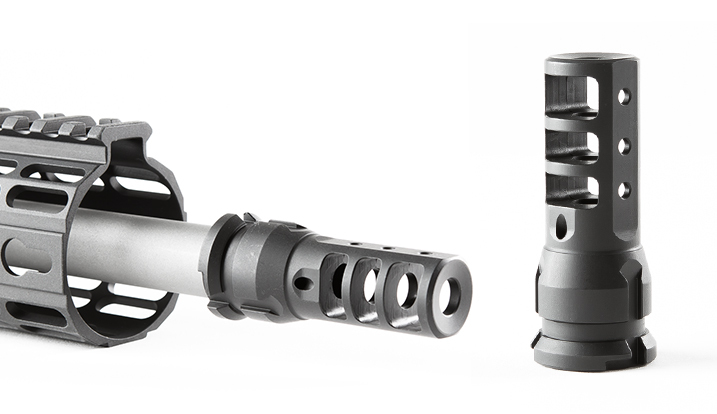 Every Sandman comes with a Keymount Muzzle Brake. No extra parts to buy. One package. Ready for action. Note: This is an NFA Firearm, and must be shipped to a gun dealer or transfer agent (FFL) with the appropriate SOT permit. Not every FFL holder is also and SOT or Class 2 / Class 3 dealer. Please see our notes on shipping for a full explanation of your obligations in purchasing an NFA Firearm.